Visually, the quasars look like bluish stars a little blurry but unlike the stars, they are among the farthest objects in the universe. These are galaxies whose nucleus emits a lot of energy. 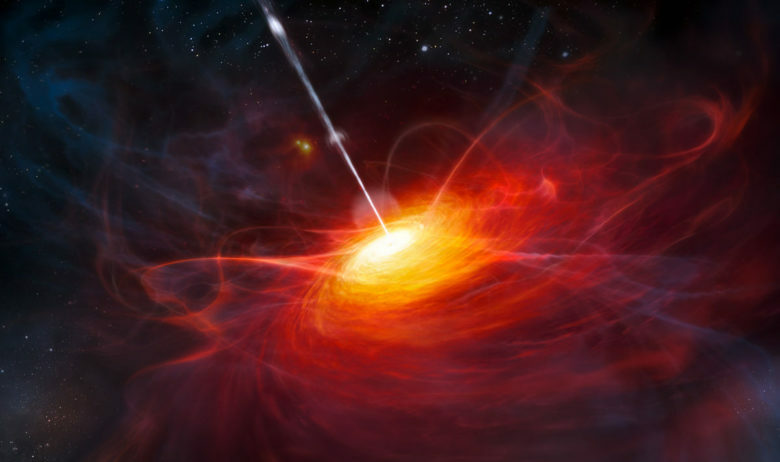 Most quasars are hundreds of millions or even billions of light years away! On the thousands of cataloged quasars, two quasars are visible in a small telescope 20 cm in diameter: NGC 5128 Centaurus A of magnitude 7.6 and 3C273 in the constellation of the Virgin of magnitude 12.8. The latter photographed here on the left is more than 2 billion light-years away and to see it one would think that it is close to the Milky Way. You see it as it was here … 2 billion years ago, when life appeared on Earth! Today this quasar has no doubt disappeared. Despite being located very far in the universe, quasars are often as bright as 1000 galaxies! In fact astronomers believe that the quasars owe their intense energy and sometimes radioelectric energy to the activity of a huge black hole that would hide in their core. But how do we know that it would be a hole black since we do not see it? As a reminder, a black hole is a star that has collapsed on itself and is a few kilometers in diameter. But its attraction is so strong that it captures everything that passes near it, even 100 billion kilometers, including the stars. After billions of years, by capturing stars and gas, it can become gigantic and reach millions of kilometers in diameter. It is black and therefore invisible because it prevents even the light from leaving its surface. However, all the gas he captures wraps around him like a swirl, revealing his presence in space. Thus you can see below a galaxy (the gray part) in the center of which is a bright yellow-orange ring (on the right magnification). And the black hole, invisible and tiny on this scale, is right in the middle of the picture. It is he who has formed the ring and who is sucking all the material that it contains through the small bright swirl that you see in the center! The black hole is the only star that can create enough energy to explain the intense radiation of the quasars and other galaxies whose nucleus is very bright and very active. Astronomers have discovered many galaxies that seem to harbor black holes; all have either a very bright nucleus or emit jets of matter very suspicious at very great distances. It has been found in the Great Cloud of Magellan, in the Andromeda galaxy M31, in the heart of the galaxy “Sombrero” M104, that of M82, etc. There would even be a small black hole in the heart of the Milky Way. As we will see in the next chapter, in the future these black holes will grow and probably absorb all the stars and even all the galaxies in the universe.